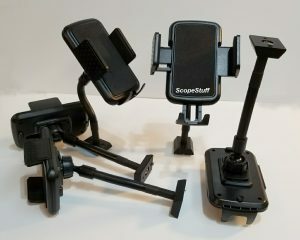 The mounting foot of ScopeStuff’s Cell Phone Mount ($22US) attaches to the Orion/Synta-style finder shoes common on many scopes. The other end securely holds smartphones 2 to 3.5 inches (50.8 to 88.9 mm) wide, which covers most of them, and the sturdy stalk bends for adjustment. The mount also incorporates a ball swivel, which combines with the bendy stalk to ensure that you can position your phone in most any orientation you desire, and it is constructed of aluminum, stainless-steel and plastic components, to better withstand the full range of harsh observing and imaging elements. First, SkySafari, with its sophisticated controls for electronic, motorized scopes. You’ve got to put your phone somewhere when using the app to control your telescope, and leaving it on the scope is handier than pulling it out of your pocket every time an input is required. Think of the Cell Phone Mount as a cradle for the super hand controller of your dreams. Second, SkEye, which mobile planetarium app’s virtual digital-setting-circle function is purpose designed to convert even the dumbest Dobs into “push-to” marvels. Place your phone in the ScopeStuff Cell Phone Mount, position the screen so it’s easiest to see (SkEye cares not how the phone is oriented to the optical axis of the scope), align the scope to a bright object, tell SkEye what object you selected (it will help you choose one, if you like), and you’re ready for a guided push-to observing session. The more sophisticated the GPS and gyro capabilities – they’ve gotten scary-good in recent years! – the more accurate SkEye’s virtual DSC. For those whose scopes have metal tubes, the Cell Phone Mount has the added benefit of positioning the smartphone away from that potential source of sensor confusion. At least one inveterate tinkerer among you has already envisioned fastening a ScopeStuff Orion/Synta-Type Finder Mounting Shoe ($14-16US) to the dashboard or console of a car, because, how cool would that be? Yeah, we should totally do that!